If you’re struggling to find pint-sized version of your favourite products for taking on holiday, then struggle no longer, as cult brand Soap & Glory have a solution! You can now take all your usual products with your courtesy of their Travel Set. It contains three bottles and two jars all under 100ml (the limit for taking on an aeroplane as hand baggage), as well as come spatulas and a labelling kit so you don’t end up washing your hair with shower gel. They also all come in a handy clear plastic case to keep them all together. So all you need to do is decant your favourite products and get packing! 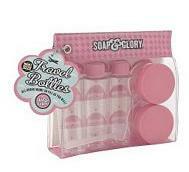 The Soap & Glory Travel Set costs £7 and is available from Boots online or instore now.